The booster pack contains 16 cards. 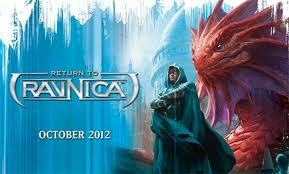 Return to Ravnica, is a Magic the Gathering expansion set scheduled to be released October 5, 2012. Codenamed "Hook", it is the first set of the Return to Ravnica block, and it will contain 274 cards. Distribution of the set is 15 Mythics, 53 Rares, 80 Uncommons and 101 Commons. There are five pictures of each basic land for a total of 25 basic lands. This is the first time that there are five different pictures of each basic land. Set 1 of 3 in the Return to Ravnica block. This block will feature two large sets (each drafted as a standalone) followed by a final small set. Return to Ravnica will feature five of the original Ravnica block guilds: Azorius (W/U), Rakdos (B/R), Selesnya (W/G), Golgari (B/G) and Izzet (U/R). The second set in the block, Gatecrash, will contain the remaining five guilds. The final set in the block will include cards from all ten guilds. As the name of the expansion implies, Return to Ravnica is set in Ravnica, a plane comprising a singular megalopolis or ecumenopolis in which a vast and diverse variety of inhabitants co-exist. Prior to the events that transpired in Dissension, the law of city and plane of Ravnica was dictated by the Guildpact and was controlled in relative harmony by ten guilds, each of which representing a color pairing of the five colors of Magic; since Dissension, however, the Guildpact has been broken and the guilds, fallen. Return to Ravnica is the 59th Magic the Gathering expansion set. Gameday will be October 27th and 28th. It is the first set of the Return to Ravnica block, and it will contain 274 cards. Return to Ravnica focuses on five of the returning guilds; the Izzet League, Cult of Rakdos, Golgari Swarm, Azorius Senate, and Selesnya Conclave. As in the original Ravnica block, Return to Ravnica focuses on multicolor cards. Also the return of the famous "Dual Shock Lands". Overload: The mechanic used by the Izzet League. By paying the overload cost of a card for additional mana, the player causes an ability to affect all targets rather than only one. Unleash: The mechanic used by the Cult of Rakdos. The player may have Unleash creatures enter the battlefield with a +1/+1 counter on it, which prevents that creature from blocking as long as the counter remains. Detain: The mechanic used by the Azorius Senate. Detain may occur as a state-based ability or an enter-the-battlefield ability from creatures coming into play. When a permanent is detained it cannot attack, defend, or have its abilities activated until its controller's next turn. Scavenge: The mechanic used by the Golgari Swarm. While a creature with Scavenge is in the graveyard, its owner may pay its Scavenge cost, allowing him/her to put +1/+1 counters equal to the power of the scavenged creature on target creature in play. Scavenge can only be activated as a sorcery. Populate: The mechanic used by the Selesnya Conclave. Whenever Populate is activated, the player puts a creature token into play that can only copy creature tokens already in play.